Shopify lacks CMS Features. 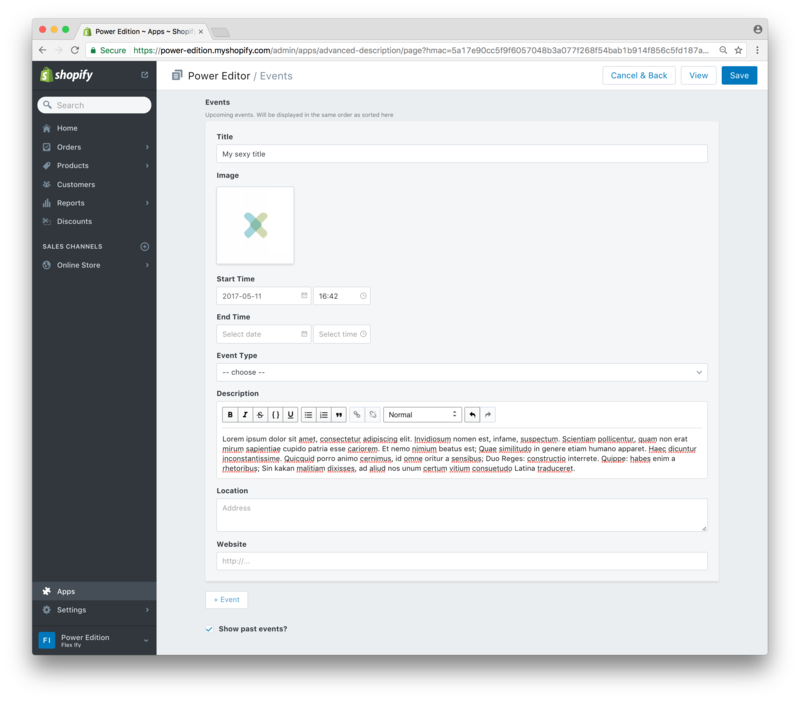 The Power Editor App brings CMS features to product, collection and content pages. It increases content management efficiency by providing Shopify admins with an excellent authoring experience. It allows to capture additional content in a structured way. This content gets stored entirely within your Shopify instance. There is no lock-in. Even if you delete the app the content will still be available. The app (or better: the content structure) has to be configured and implemented by an experienced theme designer. You model your content structure by defining a “Field Layout”. The real star is the composite field type. It is a super field that contains a combination of fields of the other types. It allows you to create multiple blocks of the same content within a single field. These are not used for validating the fields but only as (min, max and step) attributes for the html5 input[type=number] and input[type=range] element used for numbers. The product field has a few gotchas. The preview that shows the selected product in Power Editor will not work for password protected stores. Good news is, it’s just the preview. Under the hood the product handle should get saved into a metafield correctly. The picker dialog will show all products. Including those that are not set to be visible on the store front. That means that you (or your client) will be able to select products that can not be displayed on the storefront later via liquid theme code. A field definition is started with [[field]]. Each attribute is defined with attributeName = "attribute value. A definition of a field belonging to a composite field starts with [[field.schema]] and contains exactly two attribute: name and type. name = "Product Description Tabs"
instructions = "Add tabbed description here"
name = "Is this the real life?" instructions = "Enter the URL of a site"
The app adds an unpublished theme to your store. This is where the images you upload get stored. It is our solution to the problem that Shopify does not provide a way to upload files through their API. The theme is called “DON’T DELETE (created by Power Editor)”. Please tell your Shopfiy admins to not delete it. We’ll split up the metafield containing all the content into “rows” and the rows into “columns”. Each row represents a composite field entry. Each column in a row represent a child field of the composite entry. The order of the child fields matter. They show up in the same order that you defined them in the configuration step. In our example the first column, cols, contains the tab heading and the second column, col, contains the tab content. To show the tabs on our product pages we could use the approach outlined in the Shopify help center article “Add tabs to product descriptions”. Following the article, you will be adding three tabs to all product pages. In the first tab, you will load up the product description. In the other tabs you will load up the power editor content from the composite fields with the handle “tabs” that you configured above. 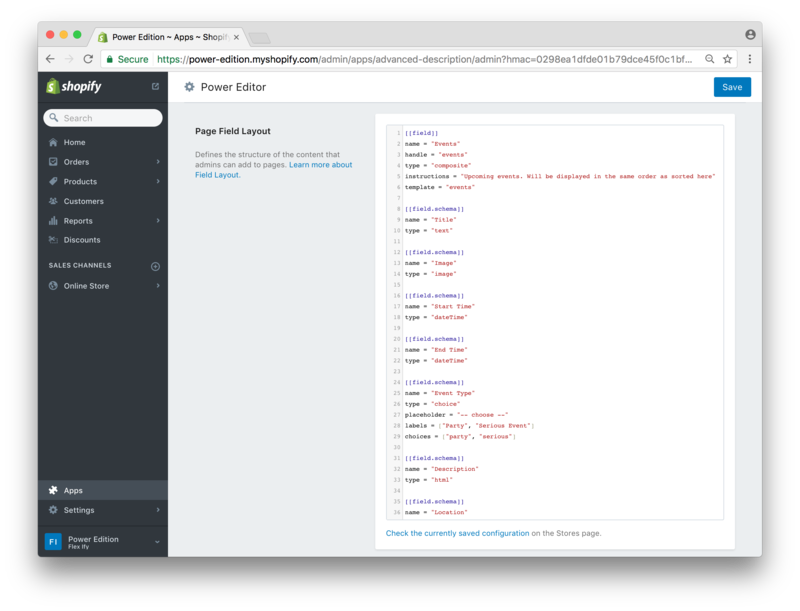 You can find more examples at the shopify-powereditor-examples Github repository.